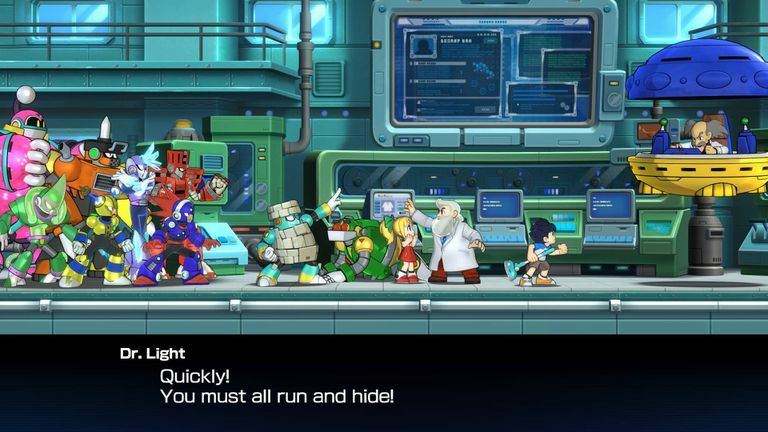 Like other Mega Man games, Mega Man 11 gives players the option to tackle the robot masters in any order they choose. Nonetheless, each one has a weakness, so there's technically a preferred boss order for Mega Man 11. The boss strategies below apply to Mega Man 11 for all platforms, including the PS4 and Nintendo Switch. You can technically start with any boss since you'll have to beat one of them with just the Mega Buster you begin with. Simply loop back around the boss chain if you choose to begin with a robot master other than Block Man. Beating each robot master grants Mega Man a new weapon. The bosses in Mega Man 11 can be defeated with just a few hits if you know their weaknesses. The bosses in Mega Man 11 change their attacks as you drain their health meter. It's easy to tell when this is about to happen because the boss will begin to glow and become momentarily invincible. Equip the boss' weakness before going into battle to make things easier. Phase 1: Stay in the corner as Block Man approaches you. When he is halfway across the screen, he'll jump toward you. Slide under him and move to the other side of the screen. Blocks will begin falling from the sky, which you can easily avoid by using the Speed Gear. Charge the Mega Buster by holding down the fire button, then release it while facing Block Man to hurl a deadly ball of energy his way. If you already have the Chain Blast from Blast Man, activate the Power Gear and shoot grenades at Block Man to make short work of him. Phase 2: Block Man will grow in size. The only way to damage him now is to send charge shots at the big red light on his chest. Stay as far away as possible to avoid his attacks. Phase 3: After returning to normal, Block Man will jump from one side of the screen to the other and hurl blocks at you. Switch to the Power Gear and shoot through the blocks in his direction. Phase 1: When Acid Man puts up his green shield, use the Block Dropper to render him defenseless. Then, switch to the Power Gear and unload on him. Be careful not to fall off the side of the platform into the acid. Phase 2: Jump over Acid Man as he dashes across the screen. When he jumps up, use the Block Dropper to stun him again, then attack him with the Power Gear. Phase 1: Jump over him as he dashes across the screen. When he jumps, you should also jump right before he lands or else you'll be temporarily stunned. He'll also occasionally hop around the room. The Acid Barrier won't protect you from his attacks, but you can shoot at him while you have it equipped to deal massive damage. Phase 2: You'll have to dodge several attacks before you can hurt Impact Man again. First, avoid the yellow lines that appear so that you don't get hit by projectiles. Next, slide across the floor to evade his drill from above. Eventually, he will revert to his original attack pattern, so you can repeat the strategy above. Phase 1: Bounce Man bounces around diagonally in a predictable pattern, so slide around to avoid him. Don't stand under him or he'll crush you. When he stops, jump to avoid his fist and ram into him with the Pile Driver. Phase 2: Bounce Man will break into pieces. Use the Speed Gear to slow down time so that you can avoid the flying debris, then hit his body with the Pile Driver again. Phase 1: He telegraphs where he is moving with a beam of light, so keep your distance. When he arrives at his destination, jump to avoid a lighting bolt attack. At the same time, you'll have to dodge two electrical balls rotating around the room. Send Bounce Ball shots in Fuse Man's general direction. They'll bounce off the walls and hit him. Phase 2: Fuse Man will begin zipping around the room and crashing into the ground. Activate the Speed Gear and jump before he lands to avoid getting hurt. He's vulnerable for a second while on the ground. Phase 3: He'll then go back to his previous pattern, but he'll fire two lightning bolts at a time, so use the same strategy as before. Phase 1: The ground is slippery, so equip the spiked boots if you have them. Otherwise, you can just keep jumping since you won't slide when you land. Stay in the middle as Tundra Man skates across the room. He'll alternate between dashing horizontally and jumping. If you just shoot your Scramble Thunder from the center of the screen, it should hit him while he's on the ground. Phase 2: He'll start dashing back and forth very quickly, so use the Speed Gear and tap the jump button to evade him. Don't bother trying to shoot him again until he reverts to his regular pattern. Phase 1: As Torch Man sends flying fists of fire your way, alternate between sliding and jumping to dodge them. Get as close to him as possible to hit him with the Tundra Storm, then get ready to slide under him as he leaps across the room. Phase 2: As he powers up, move to the center of the room. Use the Speed Gear to dodge his attacks. When he leaves the screen, watch for a red line indicating where he is going to drop down, then get out of the way. After he lands, keep hitting him with the Tundra Storm until he falls. Phase 1: He'll start off by throwing grenades in an arch. You can use the Blazing Torch to destroy the grenades in mid-air, but you'll need get close to Blast Man to hit him with it. When he runs toward you, calmly jump over him and walk (don't run) to the opposite side. The bombs he plants on the ground will follow you, but they'll explode before reaching the far corner. Phase 2: Blast Man's grenades will get much bigger, which makes them easier to destroy with the Blazing Torch, so just keep up the same strategy. After defeating every robot masters, it's time to take on Dr. Wily, but you'll have to make it through a few more bosses along the way. Phase 1: Starting from the left, the Yellow Devil will move from one side of the room to the other piece by piece. Use the Speed Gear to help you dodge the blocks. The only time the Yellow Devil is vulnerable is when he is whole, right before he unleashes a laser attack. Your goal is to shoot him in his big red eye right before he shoots you. Activate the Power Gear and send a grenade at him with the Blast Chain. Phase 2: You'll now have to deal with dozens of mini Devils. They run around the screen in a predictable pattern, so they're easy to dodge. Once they make one round across the room, slide to a corner to avoid their next attack. Only one of them has an exposed eye, but don't bother trying to attack it. Phase 3: The big Yellow Devil will eventually reassemble and shoot several balls of energy at you. Then, you'll have to repeat the whole process again. The fight might take a while, so have patience. Phase 1: Mawverne will move in a clockwise or counterclockwise pattern. As you dodge him, shoot Mawverne repeatedly with regular Mega Buster shots to open his shell. When he stops, ram his exposed core with the Pile Driver. Phase 2: Activate the Speed gear and take out Mawverne's drones with the Mega Buster. Then, continue the strategy above. Phase 3: Get away from the top ledges. He'll dash back and forth, occasionally downward but rarely upward. Use the Speed Gear and Mega Buster shots to make him vulnerable, then hit him again with the Pile Driver. Per usual, you'll have to beat all eight robot masters again in one go before you can fight Dr. Wily. To save time, equip the appropriate weaknesses before jumping into battle. Phase 1: Walk under him and activate Tundra Storm. If you run out of ammo, switch back to the Mega Buster. Activate the Speed Gear so you can jump on the missiles and fire charge shots at the ships eyes. Phase 2: Equip the Acid Barrier. It won't protect you, but its projectiles are the strongest against Wily. Make frequent use of the Speed Gear to dodge him and the gears he throws at you. Have patience and fire away when you have an opening. Phase 3: He'll use his own Speed Gear to make himself faster. The only way to dodge his attacks is to use your Speed Gear to cancel his out. Whenever he appears, wait half-a-second to activate it, then turn it off immediately after evading him to conserve your Speed Gear meter. Keep hitting him with Acid Barrier or charged Mega Buster shots until you take him out for good.